Grenades in PlayerUnknown’s Battlegrounds have been restored to their former glory, after about a month of languishing in a bit of an anemic state. The latest update for PUBG includes a serious overhaul of throwables, and tweaks a few other key areas of the game. Update 12, which came out in early May, removed frag grenades’ impact effect. The thinking at the time was that the item relied too heavily on fall damage caused by players being thrown rather than on direct damage. With Update 14, out now, knockback is back. Frag grenades now have a higher lethal range as well, increasing from 2.6 to 3.5 meters. After that they’ll do moderate damage up to 8.5 meters, and light damage up to 10 meters. We’ve done intensive research to scientifically determine which Battle Royale is best. 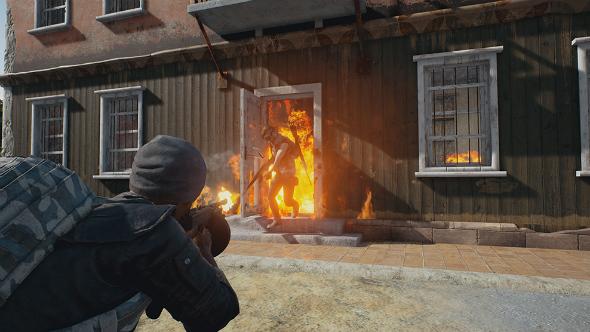 Stun grenades and Molotov cocktails have been among the least-popular pickups in the game, so those have gotten some love too. The range on stun grenades has been increased to 20 meters, and it’ll be nastier to get hit with one. They’ll now blind for up to 5.5 seconds, and affected character models will cover their faces using a new animation. While blinded, you now cannot use aim-down-sights. As a bonus, stun grenades now blind spectators watching when you get hit with one. Molotovs have gotten a rework as well. The update notes say they’ll now do more damage, and the indirect damage you take from standing in their flames has gone from 10 to 12.5 damage per second. If you catch on fire, you won’t be able to use ADS. Flames will now spread further and travel along walls and other wooden surfaces in buildings. Perhaps best of all – at least from a stream highlights reel perspective – Molotovs can now be shot in mid-air. The other major highlight in Update 14 is that the M24 sniper rifle is getting a nerf, with its damage dropping from 88 to 79. It’s also being removed from care packages and added to the loot table, so you’ll be able to find the slightly less lethal M24 on the floor from now on.